1) Mix sugar and cardamom together and make a powder of it using a coffee grinder or mixer. Keep it aside. 2) Knead the crumbled paneer for 5-10 minutes. 3) Towards the end of kneading, add sugar, cardamom mixture and saffron. Try to make a small ball now using a pinch of paneer. If you are able to make a smooth ball, then you can proceed with the next step. Otherwise, continue kneading. 4) Heat a pan in a medium heat. Add the kneaded paneer. 5) Cook it on low heat by constantly stirring it. Initially the paneer looks like thick dough and doesn't form a shape as shown in the picture. 6) After 15-20 minutes, you can see the paneer becomes thick, starts coming together and doesn't stick to the pan. At this time, remove from heat. 7) Allow it to cool for a while. After some time, knead it again for 5 minutes. 8) Divide them into equal balls and make desired shapes. 9) Garnish it with pistachio nuts. Keep in refrigerator for some time and serve chill. 10) When it is cooling down, it will become hard a bit. 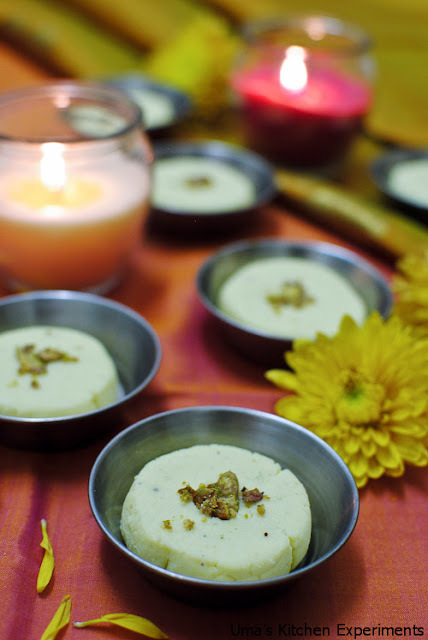 1) Try to prepare sandesh using fresh paneer. If you don't have paneer, try replace it with ricotta cheese. It will also work out. 2) Do not heat after the paneer forms a thick dough. Otherwise, you will ended up with paneer crumbles which you can't use for making shapes. 3) At the same time, do not allow the sauteed/cooked paneer to sit for long time. Make shapes when it is slightly warm. This helps making perfect shapes. 4) You can also add milk powder/corn starch before cooking the paneer in pan. But I felt adding corn starch made the Sandesh litter harder than usual. So, I skipped adding it this time while preparing it. Simply mouthwatering sandesh. Looks delicious. Looks so fab ... absolute delish n so festive ..
so tempting sandesh !! feel like grabbing it from the pic !! as usually great clicks !! Wow...delicious looking sandesh,Too tempting !!! Super delicious, love the paneer marathon. wow, excellent and yummy sandesh, pics are sure amazing Uma.. Very cute presentation, sweets with paneer is definitely a winner. 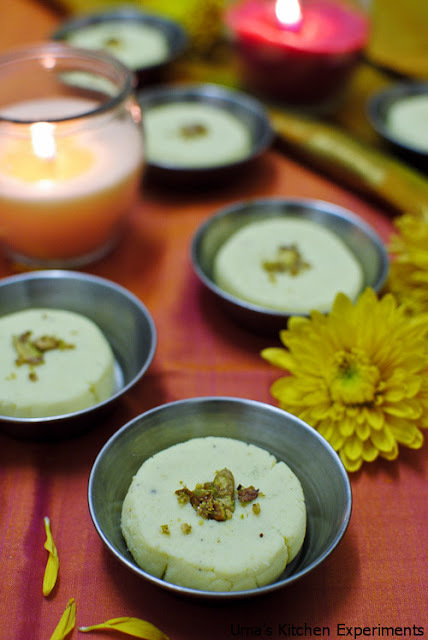 mouthwatering sandesh and beautiful presentation..
Yummy sadness,looks gorgeous in this light too. 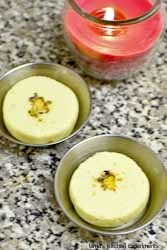 Wat an irresistible and super tempting sandesh. 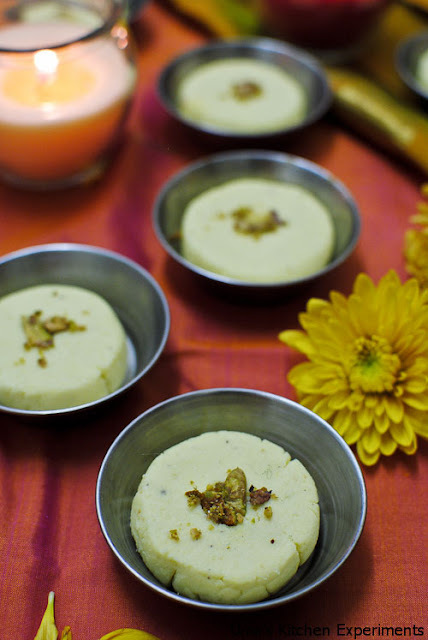 sandesh is really super paneer dish and its a sweet. bookmarked. Wow they looks so delicious Uma I love the presentation too..
Super delicious sweet Uma...thanks for sharing. wow perfect dessert! luv this! nicely presented too! Fabulous clicks n very tempting paneer..yummy!! Wat a Fudge!.Luks simple n super good!.Yummy again! My favourite recipe.., I still have it in my draft.., Bengali sweets are my favourite sweets.., beautiful clicks.. 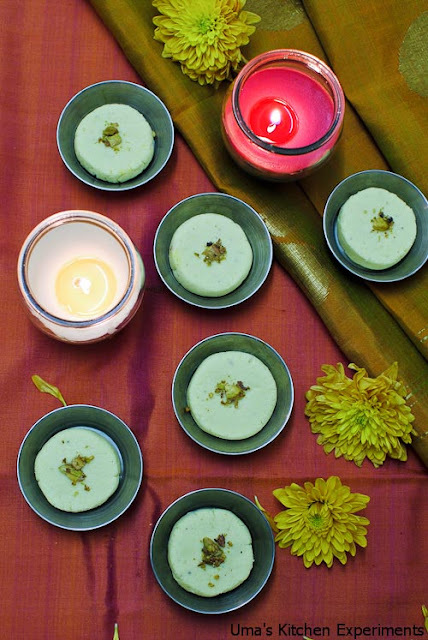 The simple,yet delicious paneer dessert :) Lovely presentation Uma ! Great sweet and well presented..my daughter's fav sweet. Sensational sandesh, looks wonderful. Thanks.